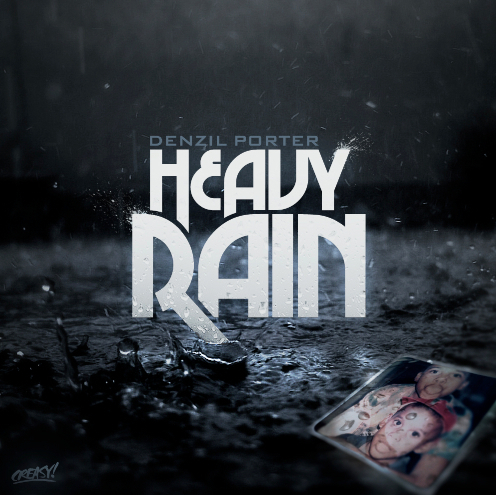 NEW YORK, NEW YORK OCTOBER 9, 2012 – “Heavy Rain”, Denzil Porter’s third release off his forthcoming project Porter’s Pot, set to release in November, is a very special track produced by Christopher “Claws” Stevens. The captivating drums, with the keys of the piano put the listener in a place where the strings represent screaming emotion on this song. When asked the recipe to this track, Denzil says, “Just add 1 bucket of emotion, a cup of aggression, 2 bags of reality, then stir”. “Heavy Rain” touches on the real stories and despair of Denzil’s brother Donald and two of his childhood friends Stephen and Sunny, who were all locked up unfairly. It was written by Denzil Porter after receiving a letter from Sunny with proof of his innocence. “Heavy Rain” is relatable to so many people because unfortunately, this is reality. Innocent people are locked up all the time from false accusations and receive unfair treatment once inside the system, ultimately trapping them for a much longer time than projected. When telling Stephen’s story, who has been locked up for almost three years with no trial, Denzil raps, “I don’t know ’bout the time I’m facing, or even why I’m still here/Caught a couple extra cases, I don’t even drink beer”. In 2009 Denzil’s brother Donald was deported to Jamaica after not paying a $25 fine. He lived in the United States since he was three years old, attended a specialized high school and was enrolled in college. Unfortunately, the DREAM Act (Development, Relief, and Education for Alien Minors) was not yet passed by President Obama, providing conditional permanent residency to undocumented residents of moral character who arrived in the United States as a minor and graduated from high school. During transportation out of the U.S., Donald would call and write frequently; never sure of his location or his destination, but knowing he just wanted to go home. On a call with Denzil heard on “Heavy Rain”, Donald says, “Threw me all over the place… Told my parents I was gonna be in Jersey, told me I was gonna be in PA… man I ended up in Texas”. At the start of each verse, Denzil Porter begins telling the story as himself before transforming into one of the story’s characters, making the record relatable to people inside the penitentiary as well as those outside who have to deal with the despondency every single day.